So parents, here’s one blog from Wow Kidz for you, so we can be of aid to release you from one of the numerous stresses that come along with raising a child. Don’t you wonder that growing up and becoming adults we become so rigid that it’s very difficult for us to change our ways of living or to develop a new habit? Well, it’s rightly said that most habits are better inculcated in the early ages of our lives. However, this may seem like a tough job for the parents, but it’s also mandatory to make sure that the children are growing up with the right set of manners. It becomes very necessary for children to develop good habits in the early stages of their life. According to the California Department of Education, "Recent brain research indicates that birth to age three are the most important years in a child's development." So it is advisable for parents to start practicing healthy norms with their young ones in their early influential years. Though sometimes it may not seem like children require the same set of mannerisms as us adults, but don't you think some practices can go a long way in our lives? We all know how prolonged a process it can be for a child to learn something fresh or to adapt to something new in their childhood. Also, teaching good habits may not always include just teaching children regimes like bedtime routines and potty training. It includes a lot more than we can count on. Another reason for that being that kids take time to process what’s being taught to them and occasionally requires repetitive training. That in itself is another problem added to the mentor’s list of ‘challenges in parenting a child’. Here, at Wow Kidz, we have a solution for one of your problems. 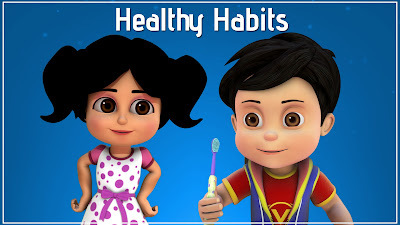 So just sit back, relax and watch this 'Healthy Habits song' with your children and teach them some healthy habits with their favorite character VIR: The Robot Boy and his friends.